The United States government on Thursday applauded the efforts of President Felix Tshisekedi of the Democratic Republic of Congo to drive a change agenda, citing the recent release of political prisoners as a promising sign that the country can become truly democratic. According to a statement issued by the State Department, the US Secretary of State, Mike Pompeo expressed support for Tshisekedi’s agenda to tackle corruption, improve human rights and strengthen security during their first meeting on Wednesday. 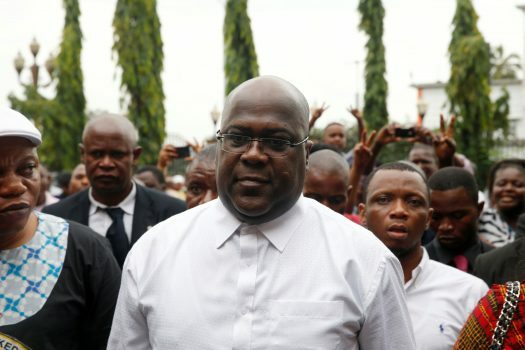 The visit was Tshisekedi’s first to the United States since winning the December 30 polls which, though marred by widespread accusations of fraud, led to the first transfer of power via the ballot box in DRC. “They discussed the future of US-DRC relations following the country’s historic transfer of power earlier this year,” the Department said in a statement. The statement also said both men discussed ways to combat the Ebola outbreak in the country’s eastern region which has killed more than 600 people as well as ways to open the country to US investments. Washington had imposed sanctions on senior government officials in the country for fraud and corruption, most of which targeted electoral Commission Chiefs and advisers. Since his arrival in the United States on Wednesday, Tshisekedi has visited the George Town University which produced the famous Congolese-American basketball player, Dikembe Mutombo. He has also visited the memorial dedicated to civil rights activist, Dr. Martin Luther King in Washington DC and addressed American investors at the US Chamber of Commerce. He is also scheduled to meet with Congolese living in the United States. It is however not clear whether Tshisekedi, who took office in January this year will meet his American counterpart, Donald Trump.